Gluten Free, Paleo & Keto Focaccia Bread 🍞 With Rosemary & Sea Salt! 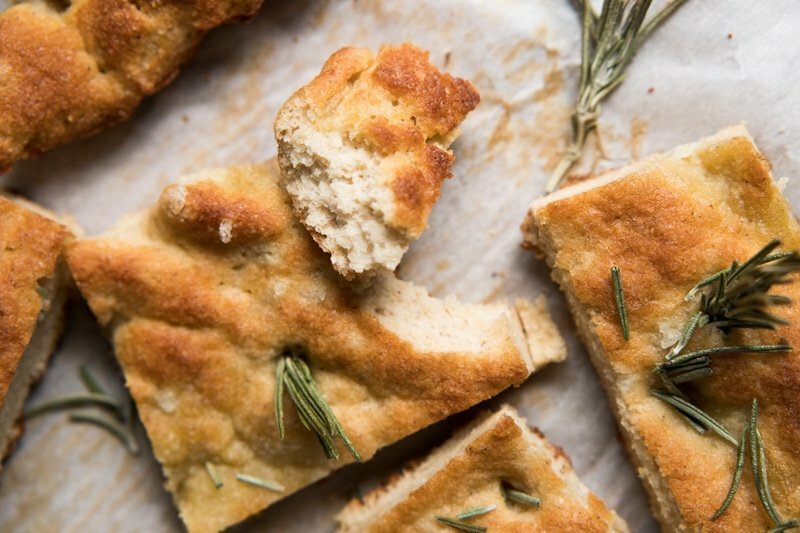 This paleo and keto focaccia bread is soft, chewy and with a killer taste (i.e. no eggy business here!). Plus, you’ll be pleasantly surprised how easy it is to whip up! 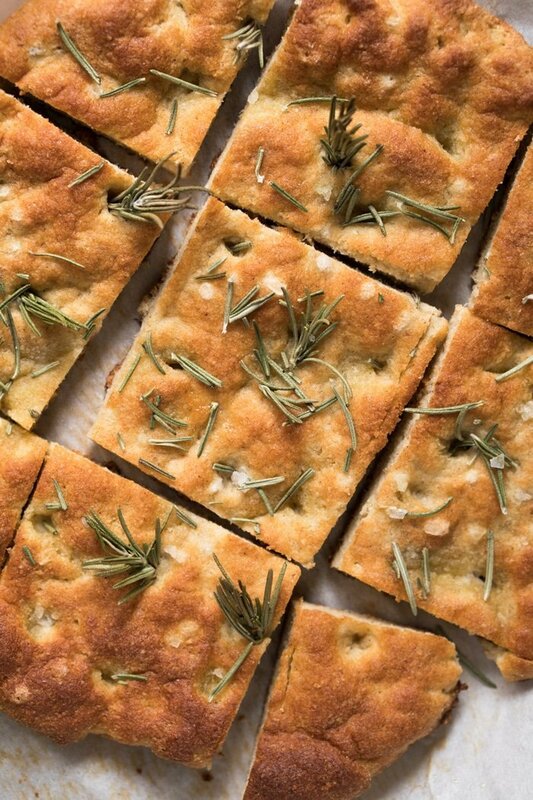 Focaccia, the Italian flatbread par excellence, is one multi-purpose bread if there ever was one. 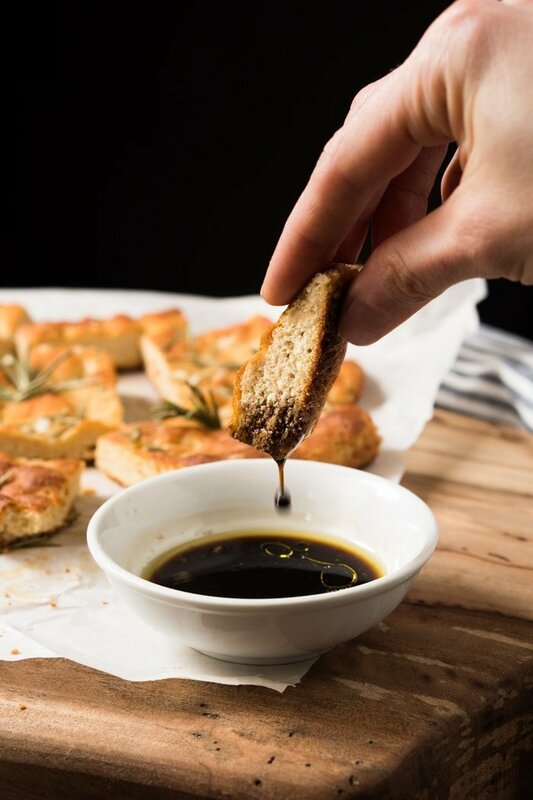 Enjoy it dipped in olive oil and balsamic for a delicious low carb and keto entree, make sandwiches out of it (i.e. panini! ), or top with a myriad of options for a pizza-like dish. 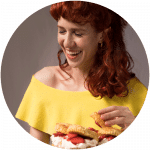 And as mentioned, this is not your typical eggy or crumbly keto bread. Think less than half the amount of eggs of your typical recipe, and a few other tips and tricks to ensure killer results. Making this paleo and keto focaccia is incredibly simple really. But, like with any yeasted bread, it does require you take care of a few details to ensure the best possible outcome. 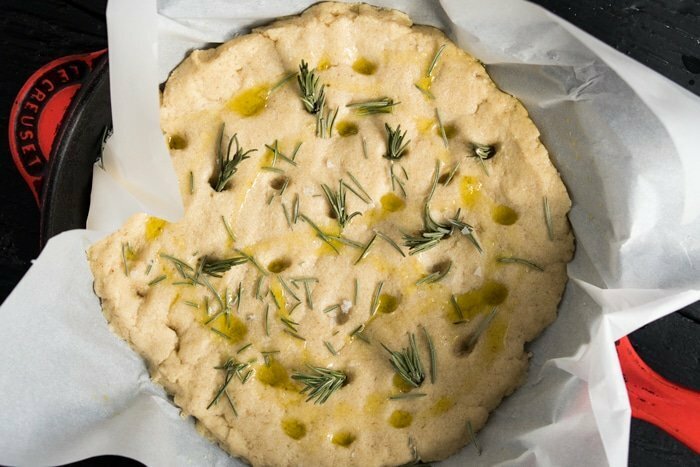 And the one thing to keep in mind is that your focaccia will likely fall somewhat post bake, blame it on the lack of starch (keto flours are notoriously heavy and moist) and certain missing proteins (think gluten). But adding things such as whey protein and more psyllium or flax meal altered the taste quite unfavorably here. So we sacrificed some rise for the sake of taste, which we’re sure you won’t object to! Also, given the grain free flours love to hold onto moisture, you’ll find that the exterior is not quite crispy. But if that’s your thing, simply give the slices a light toast post-bake. Though personally we didn’t find that necessary. 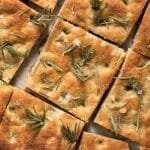 The yeast in this keto focaccia ensures a wonderful texture and taste. 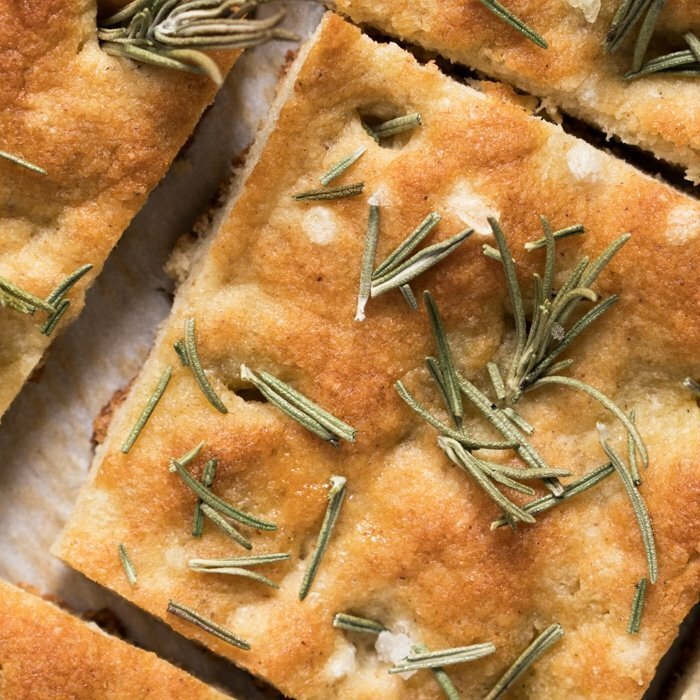 Now, how much your focaccia will rise (and fall!) post-bake depends quite a bit on your altitude. But note that you still won’t get that gummy and wet texture here of most low carb breads. Plus, we’re baking at over 7,000 feet (Mexico City here!! ), so if we can make this keto focaccia work so can you. Ingredients at room temperature. Self explanatory really, but incredibly important (particularly for the eggs). If you add cold eggs to the mix your focaccia simply won’t rise much (if at all). Baking at high altitude? Yup, so am I (Paola here!!). I’ve tried quite a few combinations, and the one modification I will suggest is to increase your oven temperature by 25°F. You may also need to decrease the baking time by 5 minutes, but that may change from oven to oven. I’ve made this focaccia also at sea level and it does fall a bit less post bake, but it’s still killer even if it falls a bit so don’t sweat it much. We like a mixture of super fine almond flour, psyllium husk and xanthan gum best. But if paleo, substituting the xanthan gum for twice the amount of flax seed meal yielded good results too, though slightly denser. As previously mentioned, for the rise you’ll want active dry yeast and a touch of baking powder. In terms of brands, for the almond either Anthony’s or WellBees work great. Both are super fine grinds. And for the psyllium husk you’ll want to use the NOW brand, as others may stain your keto focaccia purple. 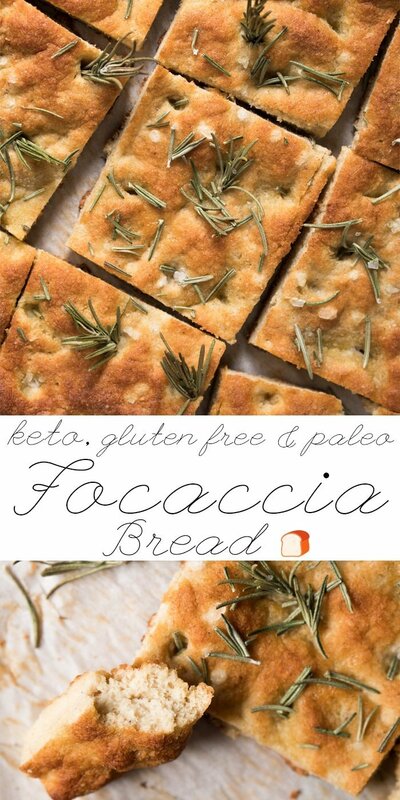 This paleo and keto focaccia bread is soft, chewy and with a killer taste (i.e. no eggy business here!). Plus, you'll be pleasantly surprised how easy it is to whip up! Mix your flours while the yeast is proofing. Add almond flour, psyllium husk, xanthan gum, baking powder and salt to a medium bowl and whisk until thoroughly mixed. Set aside. Line a 10-inch skillet or dish with parchment paper and grease with olive oil (so the dough doesn't stick while you spread it). Dip a spatula (or your fingers) in water and spread the dough until even in thickness. With your fingers wet, make indentations in the dough. Fill some of the indentations with rosemary springs and some more on top, follow with a generous drizzle of olive oil and some flakey sea salt. Cover with a kitchen towel and place in a warm draft-free space for 40-50 minutes until lighter in texture. You don't want the dough to double, but it will puff up noticeably (see pictures for reference). Transfer the skillet gently into the oven and bake for 25-30 minutes, covering with a foil dome at minute 10 to avoid excessive browning. Just be sure that the foil isn't resting directly on the focaccia (i.e. we rest it over the edges of the parchment paper). 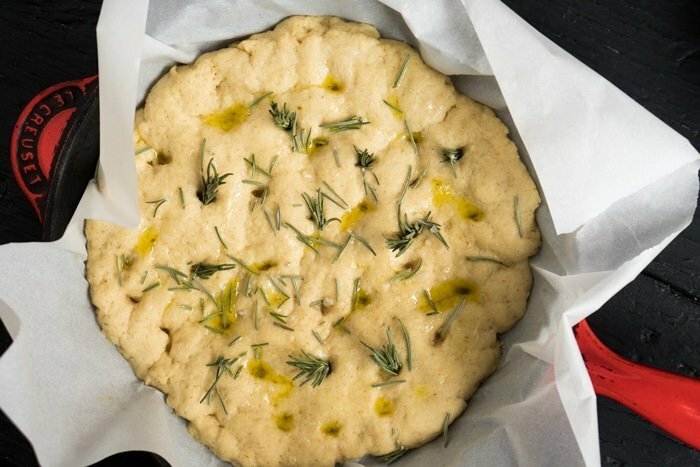 Allow the focaccia to cool completely for best texture, as the bread will continue to cook while cooling resulting in a better crumb. But if you can't hold your horses, at least give it 15 minutes before digging in (just note that texture will not be ideal, so we prefer to wait even if we have to reheat!). Keep stored in an airtight container at room temperature for a couple days, giving it a light toast before serving again. **Using ground flax seeds instead of xanthan gum will result in a slightly denser crumb. But the results will be equally delicious. How important is it to use apple cider vinegar? I have many other vinegars, balsamic, red wine, rice, white but no cider. Just use white Terru! Will have the same effect xo! I for the life of me cannot get this batter to make a dough by hand! I’ve done it twice now and wasted expensive ingredients. I’m convinced it isn’t real! What could be going wrong? How long would I have to work the better by whisking to get it to dough? I keep adding almond flour to get it to the consistency I see in the videos, but that makes it so dry when baked. Ugh! So frustrating! You’re definitely right about the hand mixer. I went out and got one since I was JONESING for focaccia on this keto diet! Apologies for the frustration. I assumed when the recipe said “Mix with a whisk or an electric mixer”, I could do it by hand (which is how I do all my baking including peaking egg whites because that’s how my grandmother taught me). Perhaps omit that part going forward so there isn’t confusion? The NEW final result was amazing. Thanks again. Is there a substitution for almond flour for those of us that are allergic to almonds? Is there a recipe that uses the leftover yolks? I’m in love with your breads. they’re always a great success. I have recently read that aquafaba, the broth from cooked chick peas is a suitable sub for egg whites. and xanthum gum. 2 Tb of that and 1 tsp flax meal! Loved by my whole family including the non-keto peeps. I’m finding little tricks for proofing the yeast and cooking in our particular oven that means it gets better and better each time! 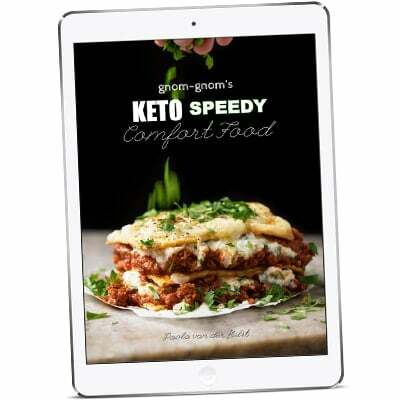 Over the moon to have found this amazing goldmine of fabulous keto recipes that actually work the way they say they will and taste amazing! Before going Keto, my hobby was baking artisan breads. 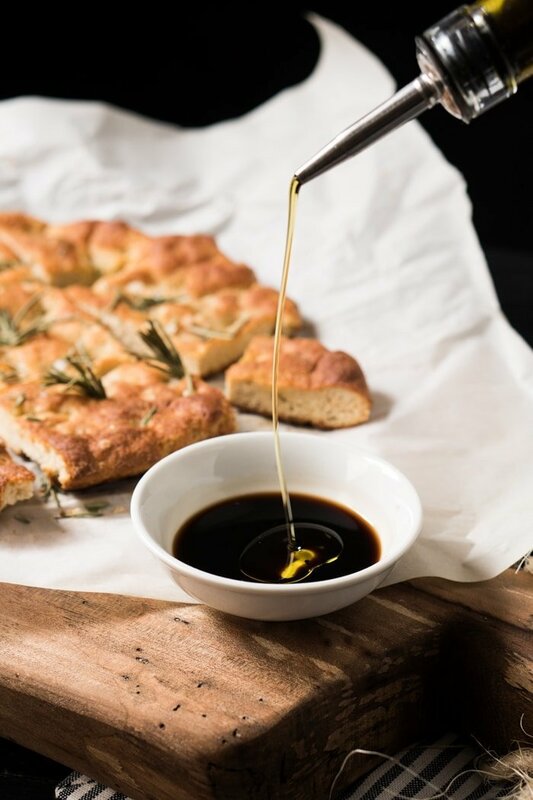 This recipe was so satisfying to make after not making focaccia for years! The yeast smell is amazing and welcoming. I liked it best the next day made into “eggs in a basket”! This message is for Lucia who asked why it felt like “sand” in her bread. It’s the psyllium husks. Try a different brand and grind it very fine. This should work.